Semiya payasam/vermicelli kheer is one of the easiest payasam that can be made by anyone in a lesser time. Whether it is a special occasion or a regularly you can just simply make this recipe and make your day more special. Semiya are thin long strings that looks very much like spaghetti however process if different. 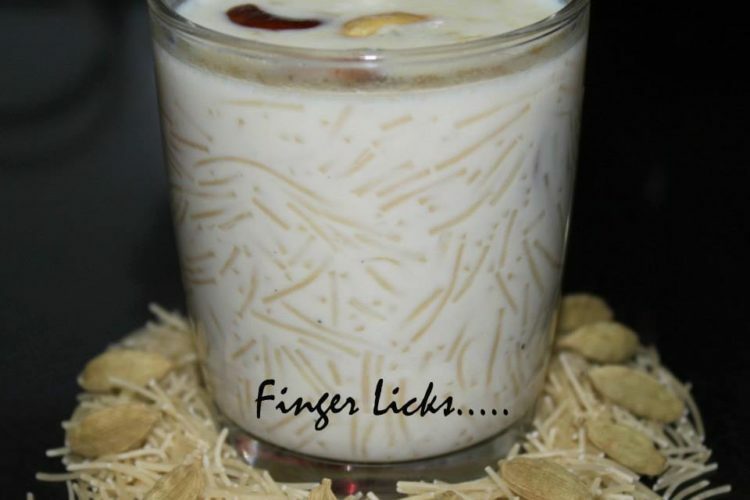 Semiya Payasam is a delicious and an easy recipe to make. Basic semiya payasam made with milk, semiya/verecelli and sugar, and then flavoured with cardamom. The semiya/vermicelli is cooked in milk and flavoured with cardamom powder or saffron (I used cardamom) and sugar is added for sweetness. Jaggery can also be used for adding the sweetness sometimes. But once you added jiggery do not overcook to prevent curdling of the milk. This dish can be made with any kind of vermicelli types according to the availability of the semiya/vermicelli. Garnish with nuts,sliced almonds and pistachios and you have a delicious dish. Warm Milk – 21/2 cups or as needed. Heat Ghee in a non stick or heavy bottomed pan. Add the nuts and when slightly browned, add kismis. When the kismis puff up, remove and set aside. In the same pan (in the remaining ghee), roast the vermicelli until it turns golden brown. You can also use shop bought roasted vermicelly. To this, add the warmed milk along with the some of the nuts (keep the rest for garnish). Close the lid and cook until the vermicelli is cooked. Now add the condensed milk(optional) or sugar as needed and cardamom to the mixture and cook for another few minutes until the mixture thickens slightly. Garnish it with the remaining nuts and serve.